Non enveloped virion, about 40 nm in diameter with a T=4 icosahedral symmetry (240 protein subunits). 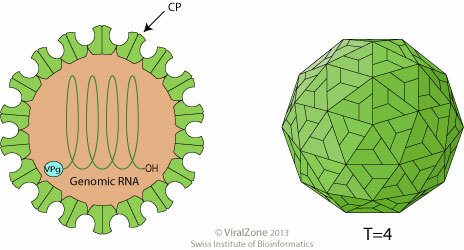 The capsid precursor is expressed from a subgenomic RNA molecule which, along with genomic RNA, can be packaged into virions. Linear ssRNA(+) genome of 5.6 kb. The 5' terminus is linked to a VPg protein, and the 3' terminus is not polyadenylated but terminates with a pseudoknot. The virion RNA is infectious and serves as both the genome and viral messenger RNA. Genomic RNA is translated into a polyprotein which is cleaved presumably by a viral protease into replication proteins. Replication produces a subgenomic RNA which encodes for capsid protein and the 17 kDa protein by RNA termination-reinitiation.